Increasing number of people venturing abroad to exotic places for vacations and business could be the ideal reason for the emergence of Fine Food or Gourmet Retailing where superior quality and authentic delicacies are assorted from across the world and brought together under one roof. The recent one to succumb to the temptation is none other than Westside that has added a gourmet and chocolate section in its flagship store in Mumbai. “It’s a big step forward for us. Though food is a lower margin and therefore tough business, we want consumers to enjoy an experience and want more consumers to come to our stores,” says Gaurav Mahajan, chief operating officer, Westside. After the pilot in Mumbai, Westside plans to take Gourmet West and Cocoa West to other stores in the country. Gourmet West stocks Chef Moshes’s signature breads, dips and sauces and imported sauces, confectionary among others”. Although, nascent in India, the category looks promising. Let’s have a look at the 1200 crore market, what all it entails and how it is growing. Much fine food which was eaten occasionally is entering every day diet. This is hinting towards a great demand, not just in fresh produce but also in other categories. Still, there is a lack of awareness about this type of food and only a few people and organisations understand the business so the market is slow. 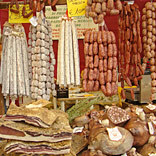 The food has good demand in hotels and modern retail at present. Last year Hypercity had added ‘GoumetCITY’ stores to it portfolio but closed it down within one year. The reason cited was, “ This was a futuristic store concept created as part of our innovation and expansion plans, but the return on investment does not make this business viable”. Fortunately, their SIS format is doing well. But Mohit Khattar of Nature’s Basket is optimistic, “If one takes a look around and learns from the mistakes of some of the retailers who have not succeeded, one has good reason to believe that mid size stores 2000-4000 sq ft stores offer the best format for survival for gourmet retailing. Smaller than this as well as larger than this lead to either dilution of the promise or higher costs leading to inefficiency build up. Envisage that gourmet retailing should continue to grow at 25-30% annually over the course of the next few years. In the context of gourmet retailing promotion that helps bring products closer to consumers can help. This of-course entails a lot of store level activation and effort as opposed to mass media led initiatives”. Since the market is slowly emerging, SIS( Shop in Shop) is the model of the time because this category of retailing is still in an experimental stage. Many retailers are of the opinion that this type of retailing needs promotion instead of just displaying them on the racks. According to Jaswant Sarvaiya of Fine Food, who are distributors of Gourmet food, “ Gourmet in India is just born and still crawling but will grow in coming years”. His company that distributes mostly to Hotels and Modern Retailers made a neat profit of 5 crores last year and hopes to double it by this year. He pays emphasis on need for promotion. And the customers need to be educated about its quality. “Of all the things, Pasta, Olive Oil, Cheese, Chips are doing well”, he shares while concluding. Frequency of purchase differs according to product categories - for example, bakery, meat products and exotic vegetables are bought on a weekly basis whereas cheese, chocolates and wines are typically purchased once a month. Taking no chances with fresh tastes that could turn sour, retailers are planning to focus on educating consumers on aspects such as product attributes, usage, quality and country of sourcing. Apart from free sampling and tasting sessions, customers have to be subtly educated on how to use some of the food products, Daily Bread, for instance, has just hired a food specialist who will train salespeople in the bakery to help customers choose the right sauces, condiments and dips for the right breads. Buche Chevre, Gruyere de Comte, Beaujolais and Cotes du Rhone will become very common words soon. Spencers, who are doing very well in Gourmet shares that there has been a phenomenal 30-40% growth for past two years. The reason behind the growth of gourmet segment are many, be it political or economical. Factors like globalization, knowledge of import policies, growth of organized retailing, changing lifestyles and having more money to spend has helped gourmet retail ( wherein mostly the imported food is perceived as Gourmet food ) to grow in Indian metro cities. Exposure is increasing due to factors like, increase in number of expatriates in urban centres, travelling abroad, television shows (Discovery Travel & Living), improved availability, restaurants outdoing each other for novelty and authenticity, manufacturers of imported food products setting up base in India (Red Bull, Dell Monte, Ferrero Rocher), distribution beyond the traditional ‘imported’ shops. Impulse products like biscuit, chips and chocolates are highly popular.Moreover, there is a switch to cooking imported dishes at home that include beyond chinese, Thai, Japanese, Italian and Mexican. Besides a different ‘look and feel’, some of the organised retailers are trying to develop the market through: A recipe based approach to stocking products, Sampling, Edu-tainment, Cooking demonstrations, Promotions and Meal solutions. There are enough potential consumers of gourmet food products in India. Food as a category is of utmost importance for any Indian retailer. Our cuisine is as varied as our cultures. So, experimenting with food comes naturally to us, hence making us a great gourmet country to be. Technically, gourmet retailing is still in its budding stage in India, yet, there is already a consumer base for it. Indians today are well travelled and well informed. There is reasonably a large section of consumers who love and use such products and an even larger segment that is willing to experiment with food from around the globe. However, there is a dearth of retailers that bring them a vast range of some of the best food from around the world and great quality stuff from reliable brands. That’s where Spencer’s come in to fill up the gap in cities e.g. Bombay, Calcutta, Gurgaon, Pune, Bangalore and Coimbatore. With the advent of others in the fray too, this segment is going to grow.